Have you been searching for an HID kit for your car? We know you don’t want just any kit — That’s why we’re offering our take on it to help you find the best. Here are our top four choices and our Best HID Kit Reviews. HID lights are quickly becoming the preferred choice in cars, SUVs, and other vehicles due to their superior performance. Most vehicle headlights use halogen bulbs, which provide only moderate light with a yellowish tint. HID headlights, however, produce brighter lights, similar to LEDs. HIDs offer greater illumination for night driving. With a bluish or whitish color, HID lights have a greater focus than halogen and cover a wider area. HID lights also last longer than regular lights. Because of their long lifespan, these headlights are more cost-effective than regular headlights. Why do you need a HID kit? HID lights provide a lot of benefits, but often you just can’t pull out those old halogen bulbs off your car and put the HID lights in. You need a HID kit as it comes with all the equipment necessary to do the conversion. Fortunately, these conversion kits are available online, so you can replace the standard halogen headlights with HIDs. How cost effective are HID lights? HID conversion kits cost more than halogen, but it’s an investment worth making for several reasons. The light quality is brighter and you’ll have greater visibility of the road ahead. This alone makes HID lights safer. HID lights have a longer lifespan than halogen bulbs. Halogen headlights last up to 600 hours on average, whereas HID lights are good for up to 3,000 hours. This means you don’t have to buy frequent replacements, which will save money. HID lights are safer. They are more intense than halogen, but not to the point that they’re blinding. The bright lights might take a bit of getting used to if you’ve been using halogen, but the quality is so much better. HID headlights also increase your field of vision, which is crucial when you’re driving on the road at night or it’s foggy or raining. Compared to halogen headlights, HIDs have better illumination so you can feel more confident about driving at night. 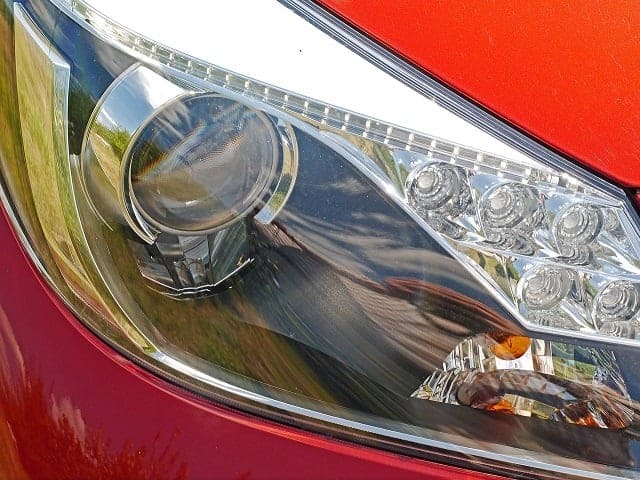 They are more energy efficient—HID lights don’t consume as much power as other headlights; HIDs use around 35 watts compared to the 55 to 100 watts of halogen lights. HID kits are manufactured by third-party manufacturers. Look for a kit that’s easy enough for someone with limited DIY car knowledge to install. Make sure, of course, that the kit is compatible with your car. Visit the HID kit manufacturer website and look for a list of compatible makes and models. Email the manufacturer if you can’t find a list. Chances are good that your car will be included if it’s a popular model. HID kits are usually compatible with older vehicles; just make sure you use a basic HID kit. Vehicles made from 2003 onwards have more sophisticated configurations and need more advanced HID conversion kits. If you drive a typical family car, almost any type of compatible HID kit will do. If you drive a luxury car, chances are they have sophisticated controls, like anti-lock braking systems (ABS) and traction control. Look for an HID conversion kit that is compatible with these features. They’re more expensive than your regular HID kit, but you’re assured of quality. 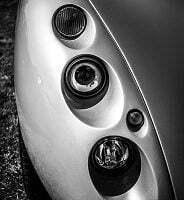 Check the bulb type your car uses, because while they look similar, the internal features vary. Most cars use H7, H1, H4, or H11, with most cars having separate low and high beams. Know what type of bulb your car uses, and it will be easier to find a HID kit that’s compatible. HID kits come in different colors and styles, so look for one that matches your preferences. 6,000K is the most popular and is the standard used by a lot of new vehicles. However, there are other options, such as pink, green, 3,000K, 5,000K, and more. Aesthetics aside, some of the fancier colors may not be suitable for road use. The rule of thumb is to avoid colors which are too bright as they could risk your life and other drivers. You should also read the local laws about what type of headlights you can legally use. You can perform various modifications for your car, including the headlight color, but make sure it conforms to the laws and won’t render your car illegal to be on the road. Your HID kit comes with detailed instructions, and usually, it’s pretty easy. This video should give you a general idea of how the installation goes. Kensun HID Xenon Conversion Kit provides intense light, even during nighttime driving, and it illuminates further ahead than most other headlights. The kit is true plug and play, so it should take no more than 20 minutes to complete the installation. Even if you have just basic knowledge of cars, the instructions do a good job of explaining what you have to do. All the equipment you need is included here, and the bulbs are very high quality. The xenon bulbs produce an intense light, so you clearly see what is up ahead. The bulbs are waterproof, shockproof, and weatherproof, so you can use these in different climates without worrying about damage. The mounting brackets and cabling are part of the package. Once you’ve installed the headlights, you’re going to see how much brighter they are compared to halogen. With many colors to choose from, the headlights won’t be lacking in aesthetics either. 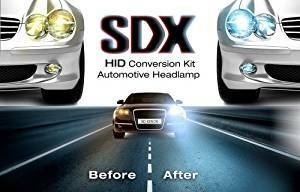 SDX HID Headlight DC Xenon Premium Conversion Kits designed to work with a wide range of vehicles. It has a plug-and-play installation, so this should be up and running in just a few minutes. The 9006 lights are bright and intense, plus they’re also built to last far longer than your standard halogen lights. The bulbs are brighter than stock headlights and they hold up well, even during the rain. The HID kit is shockproof and waterproof, so you can use these anywhere. The installation process is also straightforward, so you’ll be up and ready in just a few minutes. These headlights come in different colors like white, pink, yellow, and purple among others. The difference becomes even more noticeable when you compare them to halogen and even some LED lights. These lights function especially well as low beams, with the bluish light providing excellent visibility.The high beams also provide excellent results, and the quality is up there with the best that SDX has manufactured, and compatibility is extensive. 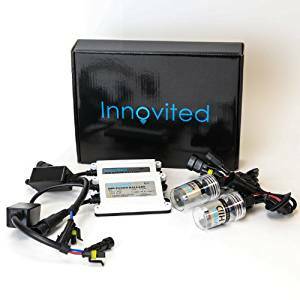 The Innovited AC 55W HID Xenon Conversion Kit is compatible with H11, H8, and H9 fixtures, and the 6,000K color gives the light a lot of power and intensity. The conversion kit comes in several colors including pink, green, 12,000K, deep blue, 10,000K etc., so you’ll find one that suits your style. The light output is comparable to other high-quality HID lights, and it’s most evident when you’re out on an evening drive or it’s raining. The light intensity doesn’t get affected even when it’s foggy, which leads to safe and more comfortable driving. 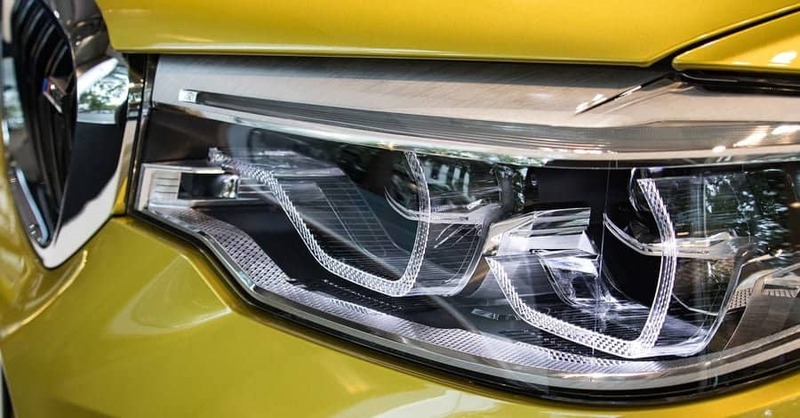 These headlights are energy efficient too, using 35% less power compared to halogen lights. The Innovited HID lights don’t produce as much heat as halogen, which leads to a longer lifespan. The longer the lifespan, the more savings you get. The Xenon conversion lights don’t have any filaments which vibrate or get damaged, so they’re easier to maintain than other headlights. The wiring harnesses included with the package are very durable and built for long-term use, even in intense heat. 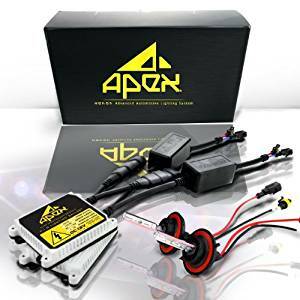 The Apex 9006 / HB4 (6k 6000k Diamond White ) Xenon Hid Conversion Kit comes with all the equipment necessary to convert your car’s halogen lights into HID. The package includes all the hardware necessary, so there’s no need to make a separate purchase. The plug-and-play installation won’t require any wire cutting. Setup takes around 20 minutes or less. Minimal technical knowledge is required, and in 90% of all vehicles, the kit plugs right in. The bulbs come in different sizes and colors, and there is no flickering, even when used for extensive periods. It also helps that the headlights don’t use as much power as regular car lights, which saves you money. The lights are waterproof, so rain won’t affect the performance. The lights are also shockproof, so a few hits and bumps won’t cause any adverse effects. Once installed, the lights make driving safer, which is ideal if you have to drive to work at night or the weather’s unpredictable in your area. HID kits used to be something of a novelty for those who had money to burn. Now, the cost has gone down, and anyone can purchase and own these. GarageChief picked out these four products because they’ve been tried and tested. However, the kit that we would recommend above the rest is the Kensun HID Xenon Conversion Kit. These Kensun HID kits provide you with a good deal of customizability, and they’re also sold in different color temperatures; this is great if you want to add a bit more style to your car. This kit also shows just how plug and play are supposed to be. A lot of HID kits say they’re plug and play but are actually hard to install. Not in this case, as they are very easy to install. The HID xenon bulbs are also more durable compared to the other kits, and that means you get more value for your money. 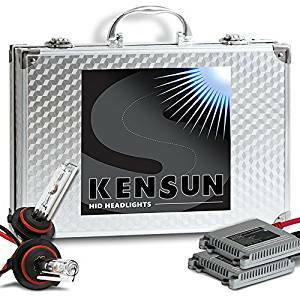 Kensun is well-known for their quality car lights and bulbs, and this HID kit is one set we won’t hesitate in recommending. They’re compatible with a wide range of cars, and add the positive feedback they’re getting, and it’s hard not to like these.